Okay so after realizing today that the pieces I'd need for a replica like the Mimeo are only getting harder to come by, I've decided to begin work on my first attempt at building an Apple I replica. I want to go with a Mimeo. Aside from the shortage of the 2519 register, am I good to order the kit from Unicorn Electronics? I know this isn't going to be just a weekend project and I will need to be patient. I am excited for it. Any lessons learned/tips you'd like to pass along? My advise is very straight forward, you need to practice soldering if you are not experienced. Build a replica-1, it is a good experience, then move to a Mimeo. Also take your time and don't do too much in a single sitting, and most importantly get the right equipment and solder. You must use a temperature controlled Iron, with a good tip and you must use good solder. The Radio Shack stuff is good enough, but Kester is better. Finally realize you will not make a 100% perfect replica, there are things about the real thing you can't replicate, so don't obsess and be happy with your end results that you assembled with your own hands. Building a clone is a real exciting experience. I received my Mimeo board last week and will start my second clone build this weekend. I believe Unicorn sells all the parts, except the board and ROMS which you can get from Mike. 1) I would use machined sockets. The original Apple I had actual very cheap sockets that became intermittent after a couple of insertions. 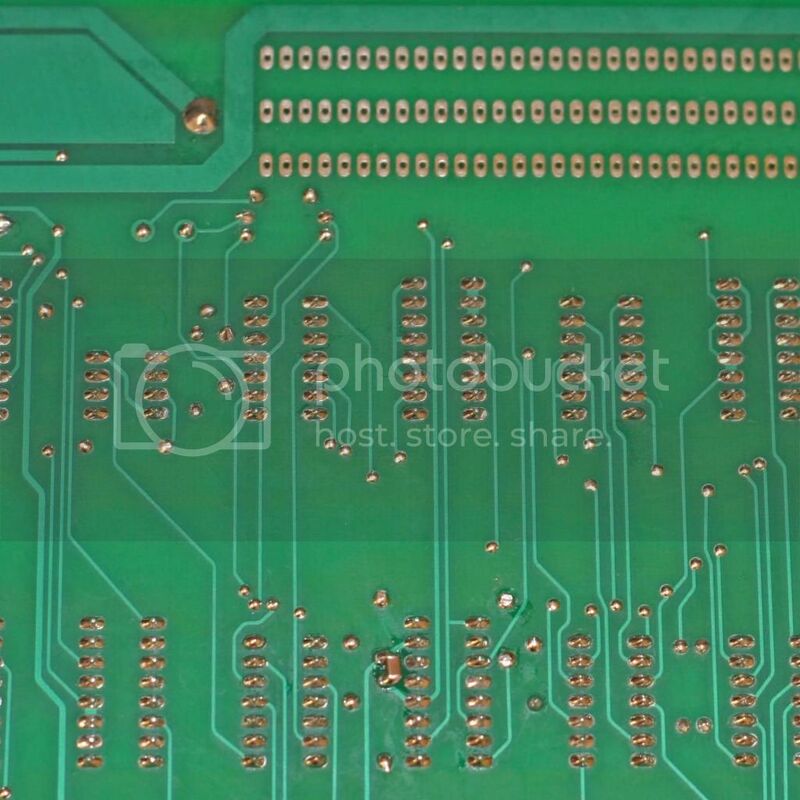 2) After the board is soldered, get a huge magnifying glass and check every chip for solder bridges. This 30-60 minutes of time is well worth it. I found about 20-30 bridges on my board which I fixed. The next three steps come directly from Mike Willegal's assembly manual. 3) Test the power supply section first. I made a mistake in this simple step. I assumed the three voltage regulators were lined up in the same way, there are not. 4) Populate the video section and test it. 5) Populate the CPU section and test it. run the cassette interface, load basic and basic programs. I also bought the PS2 keyboard interface and ACI cassette interface kits from Mike and they are well worth the money. I have built up one of Mike's Mimeos as well, and want to echo the "go slow" recommendation. possible. The results are worth taking the extra time to make it look nice. I had it right before plugging it into the mimeo. I haven't checked, but Rob at Unicorn may well have 2519's, but may only be selling them with his Apple 1 parts kits. I'm guessing that he has had trouble finding them himself and wants to continue to supply complete kits for as long as possible. I got my second computer going (a MIMEO build) this morning after some trouble shooting. 1) My video monitor was displaying the "_@" pattern (as expected), but could not be cleared. Chip swapping did not resolve the problem. I reheated all my connections on the video chip sockets and finally the display could be cleared with CLR line. The root cause of my problem here was one or more cold solder joints. 2) Next when I did a monitor dump, the screen would go blank when it was about to scroll to the next page. After examing each video chip, I found that pin 9 was sticking and not in the socket for one of 74161 counters. I properly inserted it and the video section was working properly 100% afterwards. On first computer (a Newton build), I had the following problems. 1) 7812 regulator inserted wrongly. +12 volts was not present. 2) My video display was full of unexpected lower case characters, instead of the"_@" pattern after power up. Apparently the 2513 I ordered on eBay was a lower case chip and not the standard upper case chip. But the part number was a perfect match ? A new chip solved the problem here. 3) Cursor was not flashing. Problem was a defective 555 timer. On both computers I built, the character flaring problem was present. In my case I found a 150 pf capacitor in place of the 2.2k resistor worked better for me. TTL outputs can safely handle this capacitive loading. while severely attenuating the leakage from the high frequency character clock running at around 7 megahertz. I have the following tips for testing video section, if you do not have all the Signetics 25xx parts at the time of your build. -It has been mentioned elsewhere that some digital TVs are not compatible with the Apple 1 video signal. To expand further, some digital TVs will not recognize the video signal and will generate no video image whatsoever. -Expect some bad components. Many are 40 year old surplus after all. I completed an error-free build, but had a fair amount of work (thank goodness for sockets!) to do to identify a bad 2504, 3 bad 7400 Quad NANDs, and a bad memory MK4096 chip. Several other memory chips in the lot I have show some random errors (even with good bypass capacitors). Substituting slightly later MK4027 chips has made the machine much more reliable. and being able to load BASIC and then run a game like StarTrek or Lunar Lander for hours. When I put my oscilloscope on the -5 volts and +12 volts supplies, they were super noisy with no bypass capacitors. 2) I have had problems with the 2504's as well. I found a simple way to isolate the faulty part. Run a program like Lunar Lander that scrolls the screen and note which characters change during the scrolling. The common denominator is data-bit D3, I swapped the 2504 (D4A) for D3 with 2504 (C11A) used for the cursor position. There is a good analysis of the source of the problems with -5 volts on my blog, with a solid solution. Very grateful for the info so far. but was not aware of your recent post on bypassing the DS0025 power rails. I am surprised how lax Steve Wozniak was about bypassing power rails. I know cost was a motivator, but capacitors are relatively cheap. or not working, I would have expected more diligence on decoupling the power rails. To be fair, Howard Cantin did the layout of the PCB, not Woz. He probably would have been working from a schematic that showed the decoupling caps, but not necessarily where to place them. The other problem with the design is that the switching current on clock transitions in the 2504s seems to be extraordinarily high, resulting in very high amplitude ringing on the -5V rail, which probably wasn't anticipated. In fact, the design as it is only borderline working. I think the problems some people had with reliability of their original Apple 1s (Liza Loop for example) were almost certainly due to this issue. If, by chance, the slew rate of the DS0025 clock driver is too fast then the amplitude of the -5V ringing increases to the point where the DRAM has errors. This is why a DS0026 (which has a faster slew rate but is otherwise compatible) without the decoupling probably will cause DRAM read/write issues. A DS0026 works fine for the clock driver with the decoupling caps in place. The last time I powered up my systems I meant to take a close look at the clocks to each 2504.
see I'm not the only one who has noticed this. possible substitute for the DS0025/6 parts. Schematics in general only show the quantity of coupling capacitors present, not the important detail of where they go physically on the board. Considering the Apple I was the product of a two man garage operation, I guess post-design diligence was a luxury. Scoping the power rails for glitches or checking the timing margins of the clocks would have been nice, but the Apple I was a part-time job for Woz and Jobs. Now days with super fast DRAM and CPUs, it is mandatory to measure every millimeter of data, address and control signal tracks on the PCB and do a simulation to measure delay, reflections and leakage in addition to timing margin analysis. I don't count the chip select jumpers on the 74154 nor the 6502/6800 CPU selection, those are design intent. Mike, thanks for the pointer to your blog with the bypass information. I too had missed this. -Between pins 11 and 12 on the 2513 (position D2). -Between the -12v side of the bypass capacitor and the -5v side of the 3K resistor at position C11. 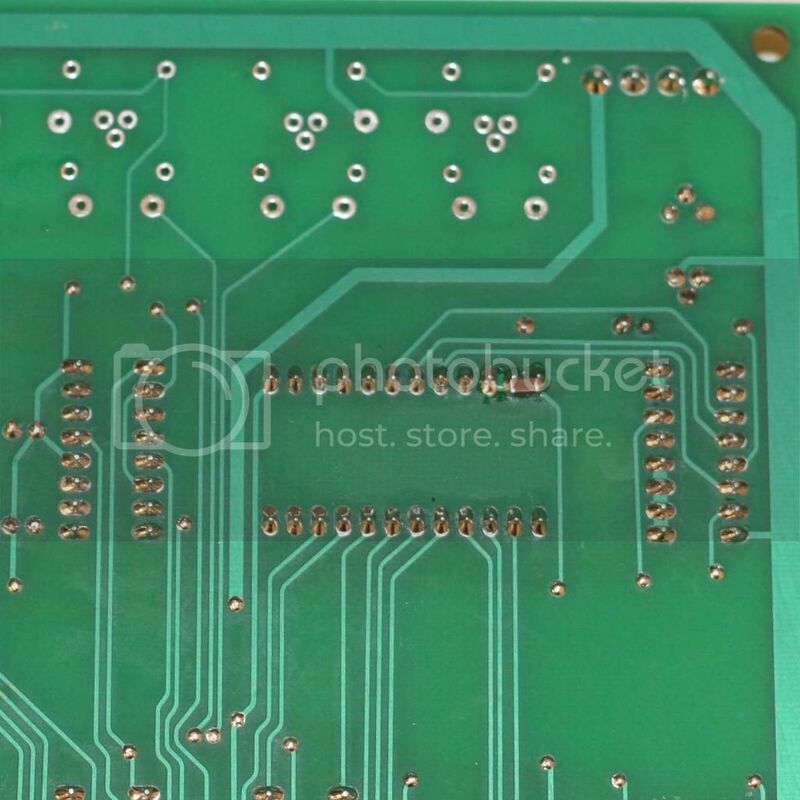 Since you are connecting the SMT cap to the -12v rail at a bypass capacitor, you are effectively bypassing the -5v also. These 2 caps are much less visually obtrusive and really clean up the -5v noise. One thing a number of us have noticed while working with reproductions of the Apple 1, is the amount of noise that exists on the -5 volt supply. The stabiliy of the -5 volt rail appears to be affected by the edges of the -12 volt clock that is used to control the video shift registers. Usually it’s not a problem, but I’ve run across a few cases where it affected DRAM reliability. Adding additional decoupling to -5 near the shift registers and the -5 regulator seems to clean things up considerably. I was wondering if any of you remember noticing that noise on the -5 volt supply and if that ever was an issue back “in the day”. I am sure that what you describe is valid, although I personally wasn’t aware of it. I did the prototype of the Apple I and debugged the PC board version but didn’t look into such aspects. I’m sure you are quite correct. We knew that this was a low volume product since we were demonstrating the Apple II before shipping the first Apple I. Hence, we did not have many to become aware of issues like this. Part of the problem was that my time was being spent on the Apple II completion. The ‘productizing’ of the Apple I came under Steve Jobs. I always optimized my prototypes for short distance wiring, but the PC board introduced longer power traces. Please forgive me. I never looked closely at this aspect. I certainly over-minimized in bypassing decoupling capacitors throughout the chips and RAM. I did worse too that was probably copied over to the PC board, like not having pullup resistors on unused TTL inputs. Still, had we at Apple been aware of such an issue while selling maybe 150 Apple I’s, we could and would easily and quickly have rectified it. But we didn’t test fully a product that was a temporary place-holder before the big product. We did try to buy back every Apple I in exchange for Apple II’s. We had more luck than anyone deserves with things working out just enough to suffice and do what we did. I will tell you that I and others did observe the power lines and did not notice noise or spiking. And, as I said, it was never a problem that was called to our attention, or at least to my attention. We could have put out an errata sheet for owners to fix the problem themselves, since this was very much a maker product (local stores could modify things to use 16K RAM’s, for example, and they did. I am totally interested in hearing such things even after all these decades. I awoke one night in Quito, Ecuador, this year and came up with a way to save a chip or two from the Apple II, and a trivial way to have the 2 grays of the Apple II be different (light gray and dark gray) but it’s 38 years too late. It did give me a good smile, since I know how hard it is to improve on that design. Mike thanks for the feedback from the Woz. What he said is exactly what I suspected. Different scenarios aggravate the problem more in a computer with only default capacitors in place. 1) The problem is more evident with 8 k DRAM in place than with 4k DRAM. 2) The problem is more visible with continuous activity on data and address busses. After the walk is complete (in about 1 hr), the contents of DRAM is corrupted. I had the ASCII test program at $0.A and $E000.E00A and it was corrupted. 3) Capacitor type and manufacturer also has an impact on the spike and noise suppression. That may be enough to get the Apple-1 board to work, but to decouple the -5V rail properly the capacitors really need to be closer to the 2504s. If you are able to, have a look at the -5V rail on pin 4 of each of the 2504 chips with a high-bandwidth CRO. You may be surprised just how much noise there is. Phil, I agree it is not a total noise clean-up (there is still an approx. +/- 1 volt peak spike at some locations) and I perhaps overstated it, but I think it is a reasonable compromise that improves reliability without being too noticeable a mod. I agree the optimal solution for the -5v bypass is a cap at the rails on each 2504 as close as possible. A proper decoupling job requires that a capacitor be placed on every (or every second) chip for each power entry. Spikes and noise are like gophers, if you cover up one hole, they will pop up elsewhere. All "holes" need to be covered up. Did you ask how? If I was going to build an Apple II replica, I think I'd enjoy making Woz's updated 2014 version as much as anything. I did ask. Regarding the two shades of Grey, they are represented in memory by either A or 5 which in both cases turns into a 50% duty cycle square wave going to the video mixer (those three resistors on the right side of the board). Changing the duty cycle of the signal (percent hi versus low) will change the shade of grey, as well as affect other colors. Woz suggested that it could be done with a resistor, capacitor and diode, though he didn't specify the exact circuit. I did some experiments over the weekend and found I could easily get an effect just by adding a 47pF capacitor to the output of the 74LS74 at B10, pin 5 (rev 0 schematics). This gave slightly different shade of gray, but didn't affect the other colors very much. However that capacitor and some other things I tried, really messes with the integrity of the signal, so I'm looking for a "cleaner" solution. Maybe I'll try using a 74LS123 one shot, though it kind of violates Woz's idea that it could be done without adding chips. Maybe the integrity of the signal doesn't matter that much and the simple capacitor solution would be fine. You could use a variable cap and make the effect adjustable. This flip flop is clocked by the system 14MHz clock, so you can't do it with normal digital logic. Also, fooling with the clock input to that flip flop would likely upset timing for the entire system. He didn't say what he had in mind for eliminating a chip or two.